The Carter Family—Maybelle, Sara, and A.P.—in the late 1920s, pictured in the Victor catalog. I have written of the illustrious Carter Family before, more than once, but nothing I’ve so far published has done justice to their tremendous impact and legacy. In fact, I doubt whether I would be able to write anything that could honor their legend sufficiently. Nonetheless, I will do my best to pay them a worthy tribute, and I cannot think of a better record to accompany that attempt than the one herein. Not only is it without question among their finest works, but it contains, according to legend, the song that brought the Carters together, and the song that tore them apart. The saga of the original Carter Family begins with the birth of Alvin Pleasant Delaney Carter in Maces Spring, Virginia, on December 15, 1891. 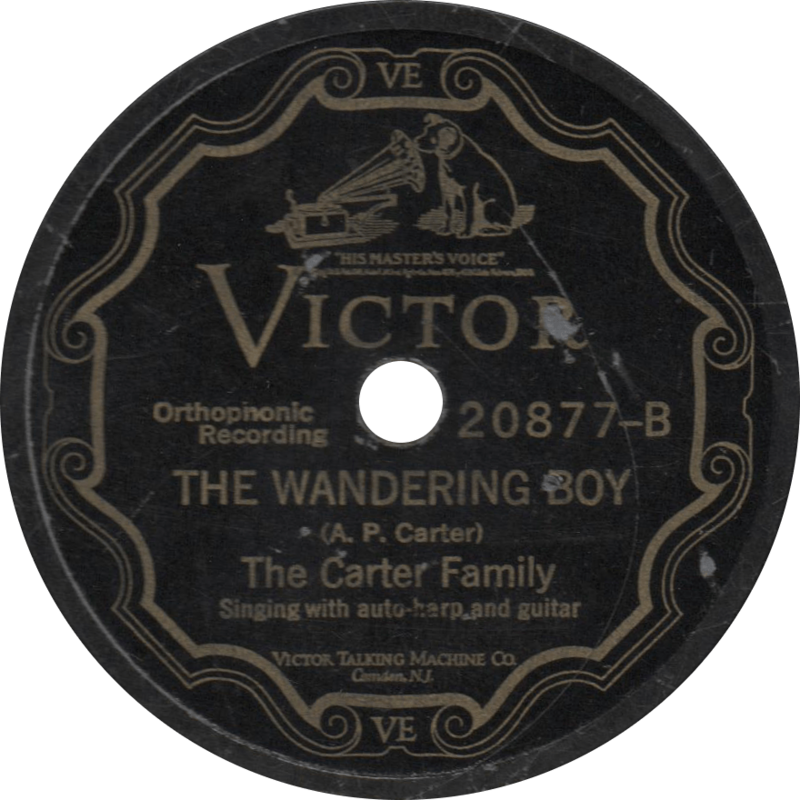 The son of Robert C. Carter and Mollie Arvelle Bays, growing up ‘midst the Blue Ridge Mountaintops fostered in the young Carter a love for music, and he took up the fiddle, but never achieved much note for his musicianship on the instrument. Music making did not put food on the table however, and so Carter found work as a traveling salesman, peddling fruit trees. It was in this line of work that he encountered the youthful Sara Elizabeth Dougherty, sitting on her porch and strumming her auto-harp. Far A.P. Carter, it was love at first sight, and they were married on June 18, 1915. In the following decade, Sara’s cousin Maybelle (who was also married to Carter’s brother Ezra) joined the couple and they formed a music group—the Carter Family. Come the summer of 1927, A.P. got word of a record session to be held in Bristol, Tennessee, about twenty-five miles away from their homeplace in Maces Spring. He convinced Sara and Maybelle to make the journey, and they arrived late on the night of August first, and auditioned for Mr. Ralph S. Peer of the Victor Talking Machine Company. 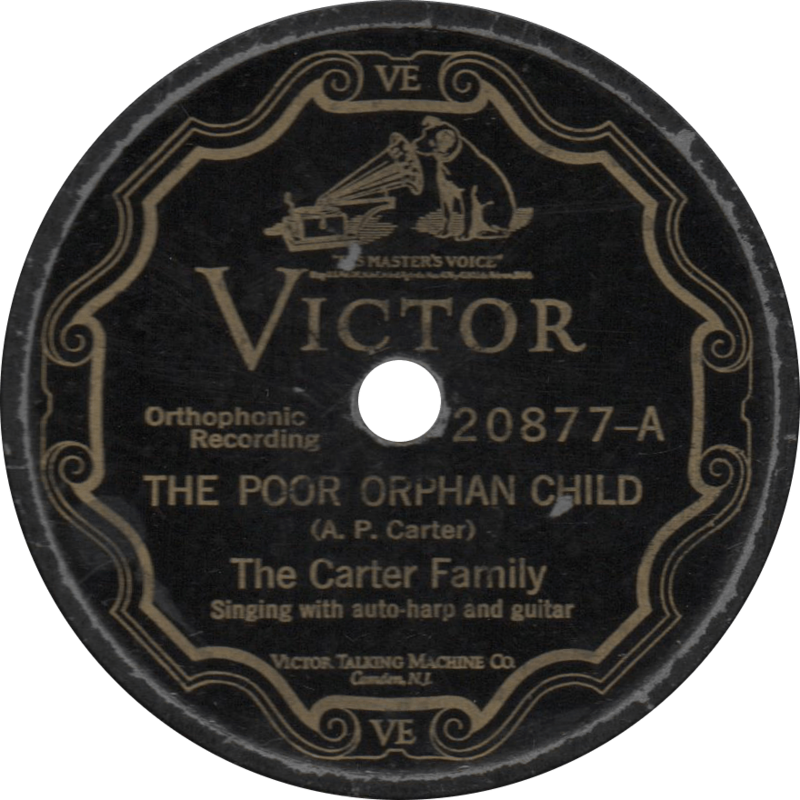 That day and the next, the Carter Family cut six sides: “Bury Me Under the Weeping Willow”, “Little Log Cabin By the Sea”, “The Poor Orphan Child”, “The Storms are On the Ocean”, “Single Girl, Married Girl”, and “The Wandering Boy”. Their first records were released that November, and proved successful enough to bring the Carters back to the Victor studio for further recordings, and they did so prolifically. Between then and the end of 1934, they waxed over one-hundred-fifty sides for the Victor company. To ensure that the group had enough material to ensure continued financial success, A.P. set out to canvas the mountains in search of good songs, which he then copyrighted in his own name. In one such travel, Carter encountered the black musician Lesley Riddle, and the two became friends. Riddle impressed both his folk repertoire and his method of guitar playing upon the Carters. 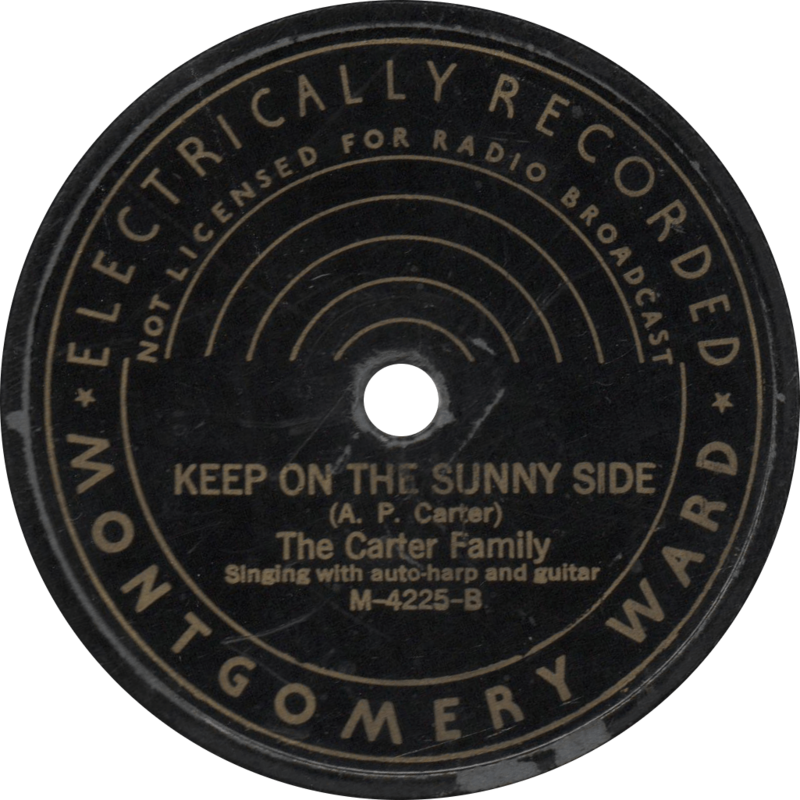 In 1935, the Carter Family began recording for the American Record Corporation, but all was not well behind the microphone, for A.P.’s long song-hunting stretches away from his family drove Sara into the arms of A.P.’s cousin Coy Bayes. 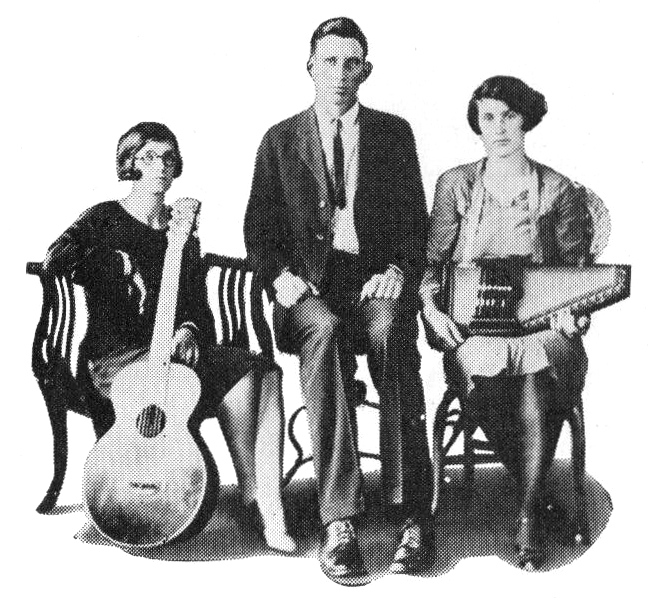 Sara and A.P.’s marriage dissolved in 1936, but the Carter Family stuck together as a music group for the time being. From 1936 until 1938, they recorded for Decca, before returning to the ARC for a string of records on their Okeh label in 1940. In the meantime, the Carter Family had relocated to Del Rio, Texas, from where they commuted to Mexico to perform on “border blaster” radio station XERA in Villa Acuña, Coahuila. The 500,000 watt station could be heard across most of the United States, and put the sounds of the Carters on the hearth of countless American homes, inspiring a wave of up-and-coming musicians. In some of these radio appearances, they were joined by the Carter children: Janette, Joe, Helen, June, and Anita. 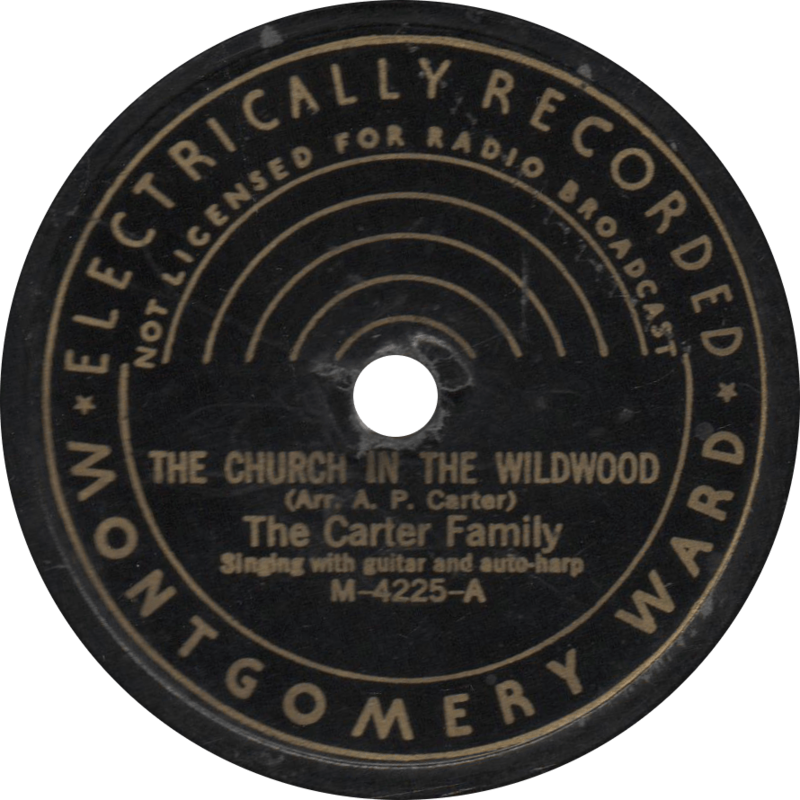 In October of 1941, the original Carter Family traveled to New York City to record one final session with the RCA Victor Company, for their Bluebird label. Around that time, they were photographed for a spread in Life magazine, scheduled to be published on December 8, 1941. With the Japanese attack on Pearl Harbor occurring the very day before, needless to say it was bumped from the publication. And thus, as the war broke out, the original Carter Family broke apart; Sara moved to California with her new husband, A.P. and Maybelle returned to Maces Spring, where he opened a general store. That was not the end of their story however, Maybelle Carter continued the musical tradition with her children—Helen, Anita, and June—performing as “Mother Maybelle and the Carter Sisters” in the years to come, landing a place on the Grand Ole Opry in 1950 and remaining active until the 1970s. The original member reunited occasionally, as well, resulting in several sessions for Acme Records in the 1950s. A.P. Carter died on November 7, 1960, his dying wish to keep the music alive. Maybelle passed on October 23, 1978. The last surviving member of the original trio, Sara Carter Bayes died on January 8, 1979. A.P. 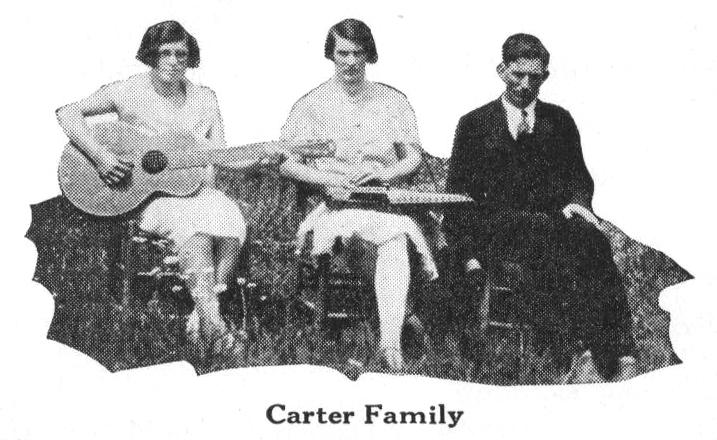 Carter’s last wishes were fulfilled with the establishment of the Carter Family Fold in Maces Spring, Virginia, founded by his daughter Janette in 1979 and devoted to the preservation of old-time Appalachian folk music. The beloved legacy of music put forth by the Carter Family remains indelibly attached to the American experience, and shows no sign of faltering as the years go by. Victor V-40089 was recorded on February 15th and 14th of 1929, respectively, at Victor’s home in Camden, New Jersey. The Carter Family consists of Sara on auto-harp and Maybelle on guitar, both of course singing. A.P. joins in singing on side “B”. The story goes that when A.P. Carter met Sara while traveling door-to-door peddling fruit trees, she was sitting out on her porch singing “Engine One-Forty-Three” and playing her auto-harp, and he fell in love at first sight and approached with matrimonial intentions. The song tells the true story of a wreck on the C & O line on October 23, 1890 near Hinton, West Virginia. This recording also bears the distinction of being one of the five songs by the Carter Family that were included by Harry Smith in his seminal Anthology of American Folk Music. 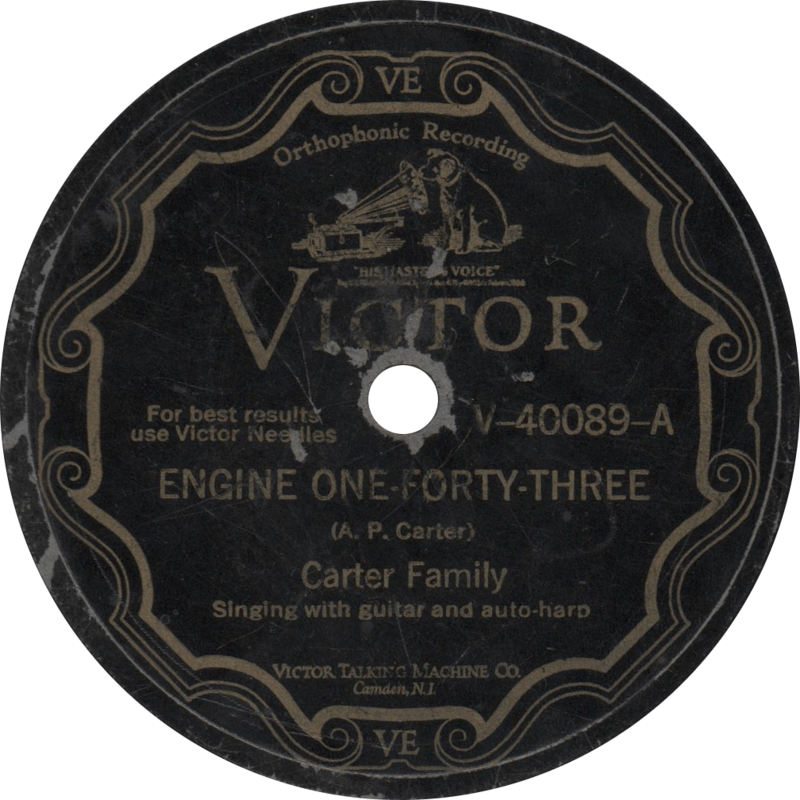 Engine One-Forty-Three, recorded February 15, 1929 by the Carter Family. While the previous is said to be the song that birthed the Carter Family, the following is said to have eventually broken them up. After her divorce, Sara Carter wasn’t happy performing on border radio with her ex-husband, while her lover Coy Bayes was in California. One show, she dedicated a performance of “I’m Thinking To-Night of My Blue Eyes” to Bayes, and he rushed down to Del Rio to sweep her off her feet and back west, leaving A.P., Maybelle, and the children to return home to Maces Spring, and thus bringing the story of the original Carter Family to its close. A standard of the Carters’ repertoire, they recorded it twice, and many other artists covered it subsequently. 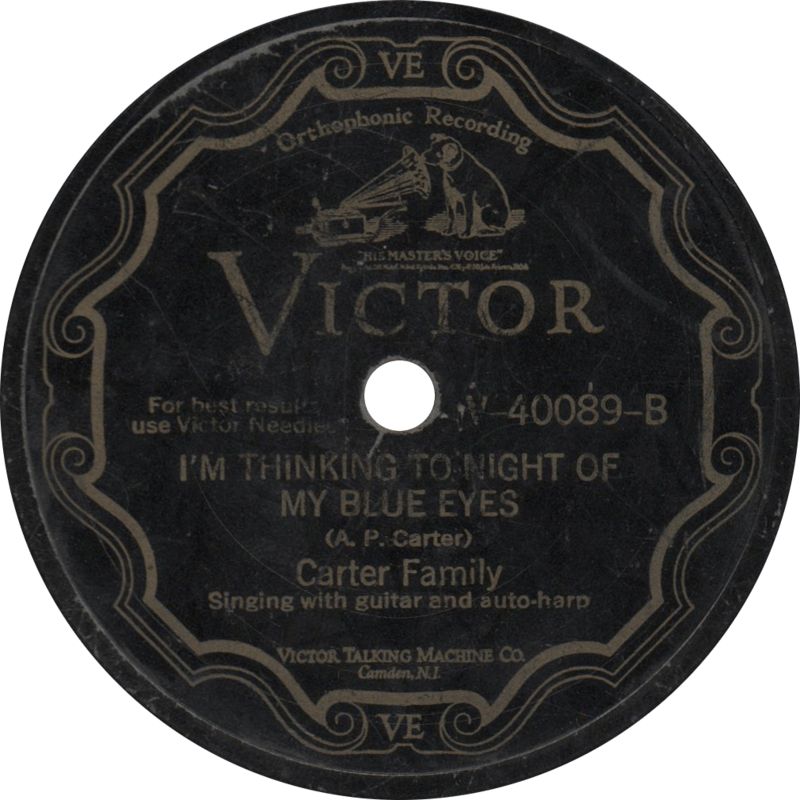 I’m Thinking To-Night of My Blue Eyes, recorded February 14, 1929 by the Carter Family.